This isn't your momma's egg white omelet! 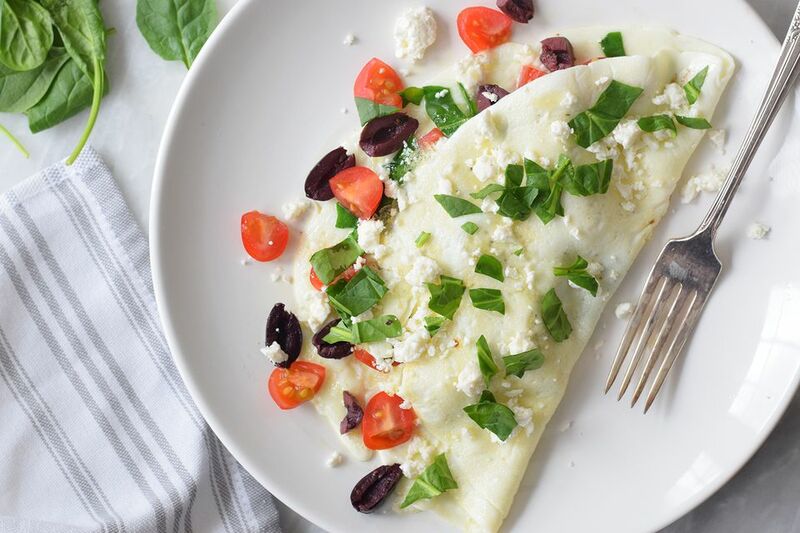 We've packed this healthy omelet full of Greek flavor—feta cheese, Kalamata olives, sweet cherry tomatoes, and fresh chopped spinach. Super healthy and super flavorful. But you can add whatever fillings you like. This omelet is super versatile and super easy. Egg White Omelets have long been enjoyed by those who want to enjoy omelets without as much fat or cholesterol. Egg whites are low in calories, and they're packed with tons of nutrition including lots of protein. It makes them a super smart choice for breakfast any day of the week. Separate the yolks from the whites. Reserve the yolks for another use. Beat the whites until they are a little frothy. Add salt and pepper, about a 1/2 teaspoon of each. Chop the vegetables to your desired size. Heat the olive oil in a non-stick or cast iron skillet. Lower the heat to low. Pour the egg whites into the pan and swirl them until they completely coat the bottom of the pan. Use your spatula to pull the egg whites to the center, exposing parts of the pan and allowing the eggs to fill the exposed parts so that it cooks completely. When the egg has almost set add the chopped vegetables and cheese to half of the omelet. Fold the half of the omelet that doesn't have filling over the filling. Cook for another 30 seconds to a minute or until the filling is warmed. Serve with more chopped veggies and dig in! Try out any of these tasty variations on the fillings. Chorizo Egg White Omelet: Add in "Mexican" cheese blend, chopped tomatoes, crumbled cooked chorizo. Top with diced avocado, salsa and sour cream. Veggie: Add sauteed mushrooms, onions, spinach, chopped tomatoes, and any cheese you like. Denver Omelet: chopped red and green peppers, chopped onions, diced ham, and shredded cheddar. Mushroom and Goat Cheese: Saute the mushrooms with a little chopped garlic. Add them with crumbled goat cheese and sauteed spinach to your omelet. Turkey Sausage and Cheese: Add crumbled cooked turkey sausage, shredded cheese, and any veggies you wish. Cook the omelet on very low heat. This will prevent it from browning and will create a delicate texture. Make sure to use a rubber spatula when cooking the omelet. Metal spatulas will break the egg whites and make it hard to neatly transfer to the plate. If you are adding meats to the omelet, warm them first. They won't be heated through in the time it takes to cook the omelet if you add them at the end.